Once the waiver is received, cleanup can be completed. 1. File a report: If you are the property owner or agent, you should file a report. You can use the electronic form, filed under e-reports, graffiti. Include in your report if you are the property owner and have signed a waiver for removal. 2. File a Graffiti Removal Request Form: click on link below and fill in the requested information and submit the form. Call Reno Direct at (775) 334-2099 for more information. 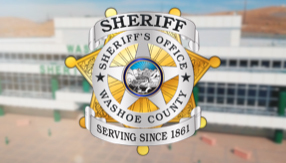 There has been a noticeable increase in graffiti throughout Washoe County. The Reno Direct Graffiti hotline receives an average of 450 calls per month to clean up “tagging” around the City of Reno and Washoe County Jurisdiction. Property owners should have graffiti removed within 24 hours of its appearance. This prevents the offender from receiving the “fame” and “recognition” desired when other taggers see their “tag”. This reduces the likelihood that the tagging will spread. Graffiti, like other forms of vandalism, is a crime. If you see graffiti in progress, report it to the police immediately. The GTF currently consists of three abatement vehicles working an average of 7 days a week for up to 8 hours a day. A Washoe County Work Crew Supervisor oversees the operation of one of the abatement vehicles with a crew of 3 inmates. The other two abatement vehicles are one man abatement vehicles which are staffed by City of Reno Graffiti Abatement Technicians. These abatement vehicles have the capability of water blasting and sand blasting graffiti from various types of materials. 1. Tagging: Individuals involved in this type of graffiti refer to themselves as “taggers” or graffiti writers. They attempt to gain status through painting their “tags” in as many places as possible. In addition, they may paint “pieces” which are highly stylized murals. This type is usually illegible to the untrained eye and intended to be seen only by other “taggers”. 2. Gang: This type of graffiti is mostly done by gang members or gang associates. This form of graffiti is a method of communication. It is used to promote a gang, mark territory, recruit members and/or intimidate a neighborhood. Graffiti sends the message that the area is unsafe and can cause concern for the personal safety of members of the community. Also, it invites more littering, loitering, and even more graffiti. It may also lead to an increase in other crimes and acts of violence. Property sales slow and property values decline due to the fact that many areas filled with graffiti are simply unappealing. Graffiti is an act of vandalism that costs hundreds of thousands of dollars to either remove or cover each year. Every dollar spent on graffiti removal is a dollar that could be spent on other community programs.